Duluth is beginning the arduous task of taking stock of the devastating damage left behind from Wednesday's historic floods, but this much is clear: The city is going to need to helping hand from the federal government to put itself back together again. To that end, Minnesota officials have asked the Federal Emergency Management Agency to assess the damage, a first step in the process of applying for more disaster aid. The numbers so far are staggering — more than $100 million in infrastructure damage in the region, and at least 1,400 miles of roads will need repair in St. Louis County. And local leaders expect the federal government to foot a large portion of the bill. 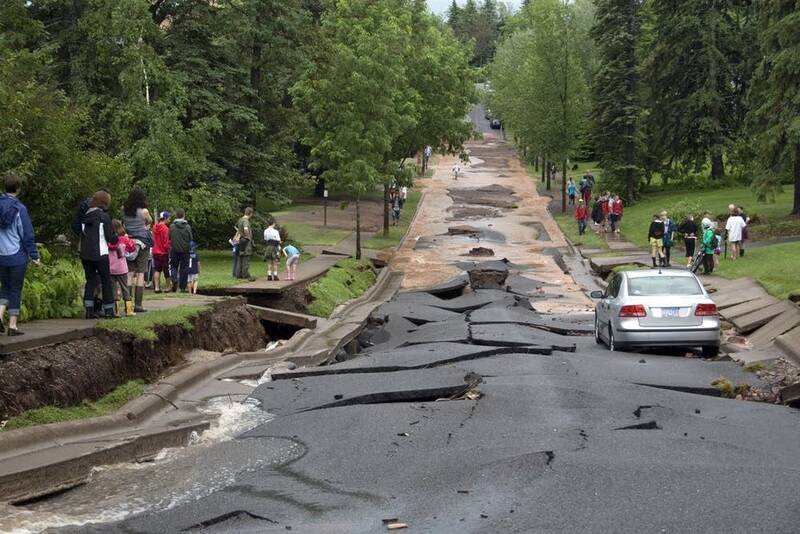 One neighborhood in Duluth looks as if an earthquake struck. An entire road, half a block long, has sunk five feet into the earth. Huge slabs of pavement have buckled up. It's this scene that confronted Gov. Mark Dayton Thursday as Duluth Mayor Don Ness guided him through the wreckage on a tour of the city's hardest hit areas. "You can see just in this one block it's going to be extraordinarily expensive to rebuild the base, the sewer infrastructure below, and then to rebuild the road," Ness said. Rebuilding the road can cost $3 million for one mile of road, according to Public Works and Utilities Director Jim Benning. He points out several driveways that are inaccessible. "We can't wait too long. These people will be patient, but it's got to be a matter of days before we really have to start acting on a case like this," Benning said. "We've got other situations where it's a dead-end road and it's even worse." City leaders say they will begin repairs immediately, but also say the scope of the damage demands federal assistance. After the tour, Dayton pledged to do what he could to ensure federal assistance will be available. "The wheels of government don't turn as rapidly as people would wish they would and need them to in this kind of emergency situation," Dayton said. "We will do everything we possibly can to speed up the process." For the federal spigot to begin flowing, the governor first must formally ask President Barack Obama for federal disaster emergency assistance. Mayor Ness said Dayton assured him during the visit he would make that request., which will prompt involvement and an assessment from FEMA. "And if they agree and say, 'all right, yes, this meets all our thresholds,' then the money will become available," Ness said. Ness acknowledges it could take weeks or even months for the federal money to flow. In the meantime, city crews and state officials are quantifying the extensive damage to streets, sewers and storm drainage systems. That documentation is needed to secure federal funding. The Fond du Lac neighborhood in far southwest Duluth is still submerged. "Houses were ripped off their foundations. Just crazy. I've never seen it like this, just unreal," said Will Johnson, who had just boated across the St. Louis River from Superior, Wis. to deliver supplies to a friend. "There's a lot of houses — halfway up the houses full of water." About a dozen homes across the city have been knocked off their foundations, Duluth Police Chief Gordon Ramsay said. In Fond du Lac, 85 people were evacuated from their homes. Another 50 have chosen to ride out the flooding. Ramsey said he checked on the ones who stayed. "We saw a few of their individuals out on their deck. They gave us the thumbs up sign," Ramsay said. "One guy was waving to us as he drank a beer on his deck, but it was quite a scene to see this rushing water right alongside of him." Ramsay says they will return to check on those residents and see if any have changed their minds. Up on top of the hill overlooking the river, Ramsay said a small neighborhood of about a dozen homes near the Spirit Mountain ski area has been completely cut off. The only road in or out has been washed out on both sides. "These culverts that were washed out; the main one was 100-feet long and down about 40 feet," Ramsay said, "These are literally canyons that have just popped up." It will take at least several days to build a temporary road to reach those residents, Ramsay said. In the meantime Duluth officials emphasize that people should stay away from what they have dubbed "attractive nuisances," like the raging creeks and enormous sinkholes that have attracted throngs of gawkers. Melissa Simmons has seen them on her street, where the governor visited. "My kids should have set up a lemonade stand yesterday because you cannot imagine how many people have come through, and it's continued this morning," Simmons said. For now the scenes of destruction are a curiosity, but soon they'll be nuisances. No neighborhood was unscathed. City officials ask for patience as they begin the long process of rebuilding.